Well hey! Now that baseball has started for both boys I pretty much live at the baseball fields and survive off of concession stand pretzels. Not much sewing happens during baseball season unfortunately! Since I had this quilt all basted from the Spray Basting Tutorial I thought I might as well do a quick quilting job. Thank you for all the wonderful comments and input on that post by the way…I love learning from you guys and I got some wonderful tips and ideas! 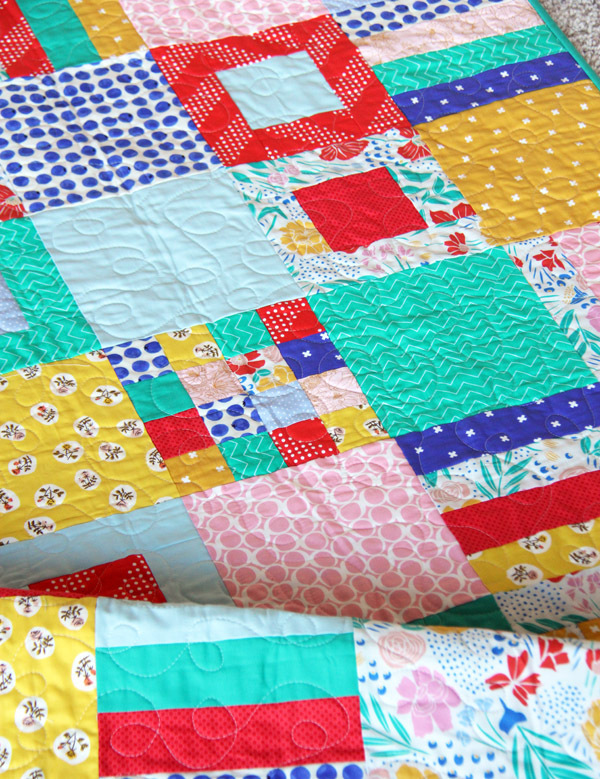 I did some super big and quick loopty loops on this quilt so I could send it to it’s new home. If you missed it this quilt is made with the free Squares and Strips tutorial you can find here (click here). The previous post about this quilt is here. 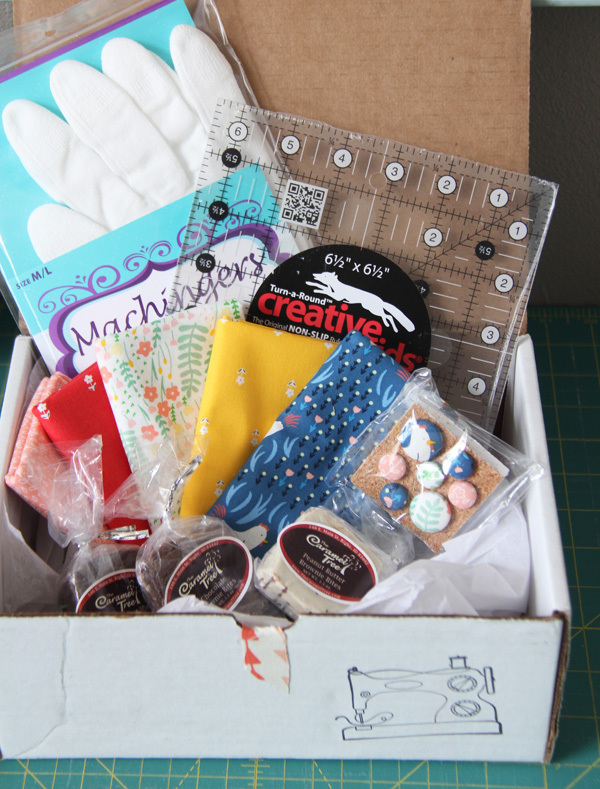 I had so much curating April’s Quilters Candy Box! I love this collection Fresh Dew by Paula and Waffle for Dear Stella fabrics…chickens! I loved my Quilters Candy box. As soon as I saw that you were curating it, I knew I had to sign up for it! I was so excited to get two of your patterns that I didn’t already have. My quilting gloves were wearing out so, these were perfect too! Thank you for choosing ALL great items. Now I just need to decide what I’m going to make with the Fresh Dew fat quarters!!! 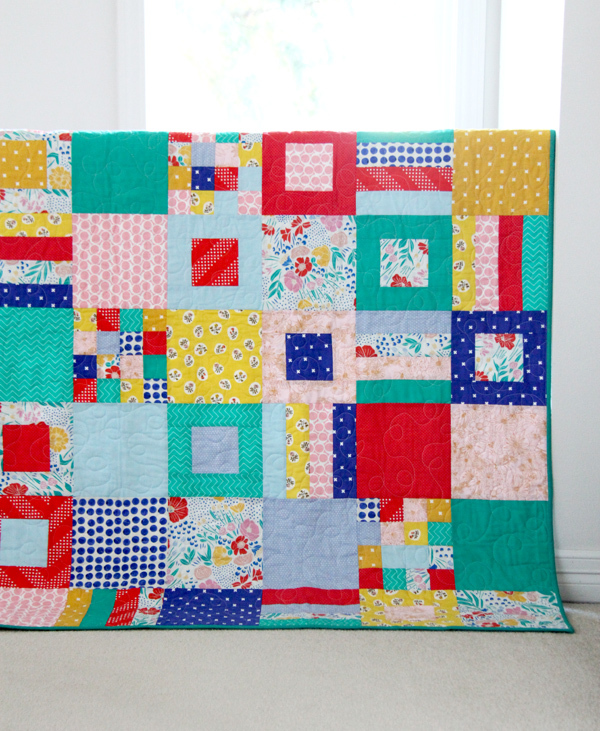 Love the way this quilt turned out! Super job! I remember those days. I did a lot of reading back then. Of course mine were not baseball fields, just a lot of after school activities almost every single day. I do remember wishing I had an oven and a sewing machine in the back so I could get dinner made and make stuff, but back then I read all of the Harry Potter books as they came out. I love this joyful quilt. I love your style of quilting too. Thanks Allison! 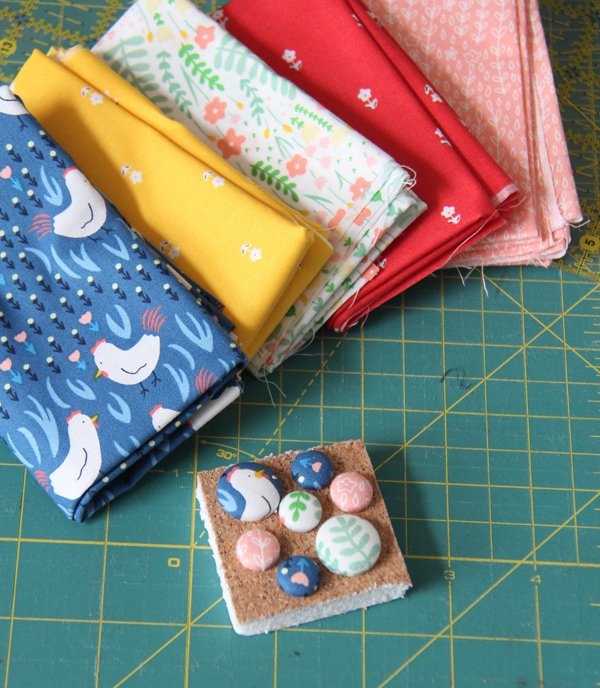 I managed to find all of the prints and actually ended up having enough fabric to make a pow wow baby quilt as well. Kind of stuck on what to put on the backing. I noticed you did some sort of print with lettering which would be adorable. by the way, Hawthorne is amazing! Uh oh, there’s a fox in the chicken box! Did you see it? They are still there, right under the material requirements table it will tell you “click here” for fat quarters or 1/4 yards. Don’t read it on a mobile device…for some reason my tables don’t work with mobile devices! YES….ring pops are the worst and we’ve probably had 100 of them since baseball started! I’m scared to look in the backseat of my van…it might be easier to light it on fire and walk away. ;) We will survive baseball season!! 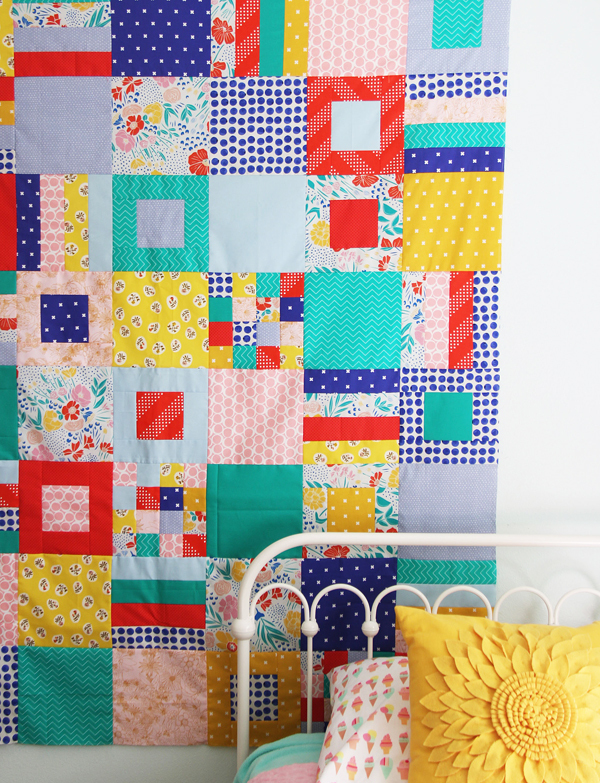 I’ve made this squares and strips quilt soooo many times. 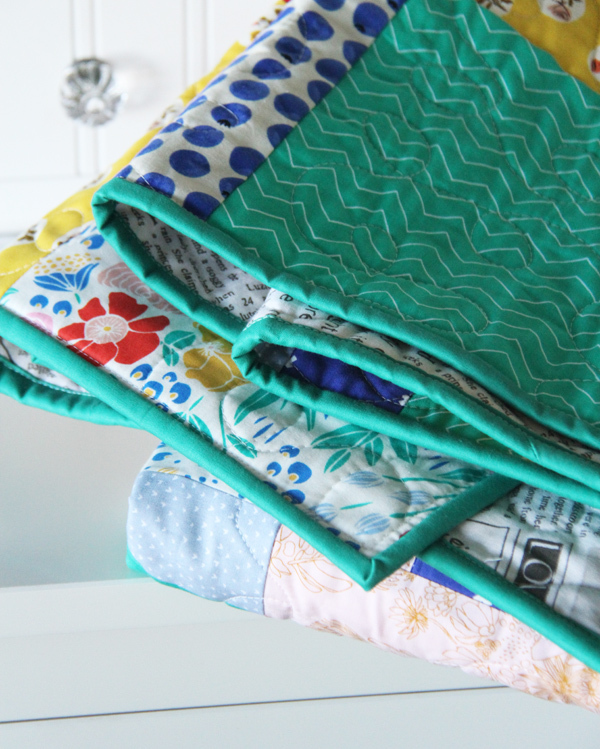 I love that you have ZERO waste with those fat quarters! Thanks for this awesome pattern!